Guthrie Wilson’s first novel Brave Company (1951) was an international best seller. Based on his experiences as an officer with NZ Army 25th Battalion in the 1943-45 Italian campaigns, the climax is the Senio action where many of his men were killed. Wilson himself was captured and faced a firing squad. He later was awarded an MC for Bravery. Born in Palmerston North 1914, Wilson graduated First Class honours from Victoria University College in 1935, was a rugby blue and a Rhodes Scholarship nominee. He taught and coached rugby at Marlborough College and Palmerston North Boys’ High School. Wilson’s fourth novel Sweet White Wine provoked public outrage as well as a groundbreaking lawsuit. The Manawatu Daily Times wrote a vicious review – headed: From Sour Grapes and Twisted Vine Comes Sweet White Wine. In 1956 Guthrie Wilson successfully sued the newspaper and was awarded damages of £1,500. Success in the court of law, however, compromised Wilson’s teaching career and forced him into exile. 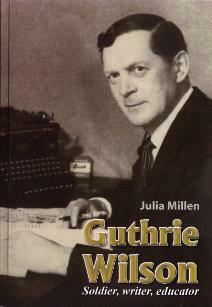 The Wilson family moved permanently to Australia where Guthrie published four more novels, one of them using a pseudonym. He died in Sydney in 1984, aged 70. First published 2006, 214p. illus with maps.